The judges for Caldmore’s best shop front and gardens competition took to the streets on May 30th and were delighted to see that local traders and residents were increasing their efforts to show Caldmore at its best. Chair of the Traders Association, Ali Mahmood commented on the impact which local shops were making “This is the 2nd year we’ve run the Top of the Shops competition and in the last 12 months new businesses have moved into the area and helped raised the standard. I’m delighted that they have invested in premises which were previously an eyesore and which as a result of their efforts are now setting the benchmark for others to aim for”. Not forgetting traders who have been in Caldmore for many years Ali added “Last year’s winner of Top of the Shops, Walsall DIY is looking even better than ever and a special mention must be made of butcher Andrew Morrison who celebrates 50 years of trading in Caldmore and never failing to keep a well presented frontage throughout that time”. Joining Ali in the task of judging were Denise Perry, Area Manager for Walsall South, and Margot Lambert of Caldmoreaccord. Denise was particularly struck by the impact which the winning Des Res front gardens in 2011 were having as there had clearly been work going on in neighbouring gardens. She said “This is what we hoped for. With more and more people over time taking an interest in how Caldmore looks and ‘doing their bit’ we will improve the image of Caldmore and show what great community spirit there is in the area”. Amongst those warranting special mention were the ‘guerrilla gardeners’ who have planted flowers in the grassed area at the top of Arundel Street, several gardens in Newhall Street and Albadars grocery. Winners will be announced at the Village Festival on Monday 4th June. 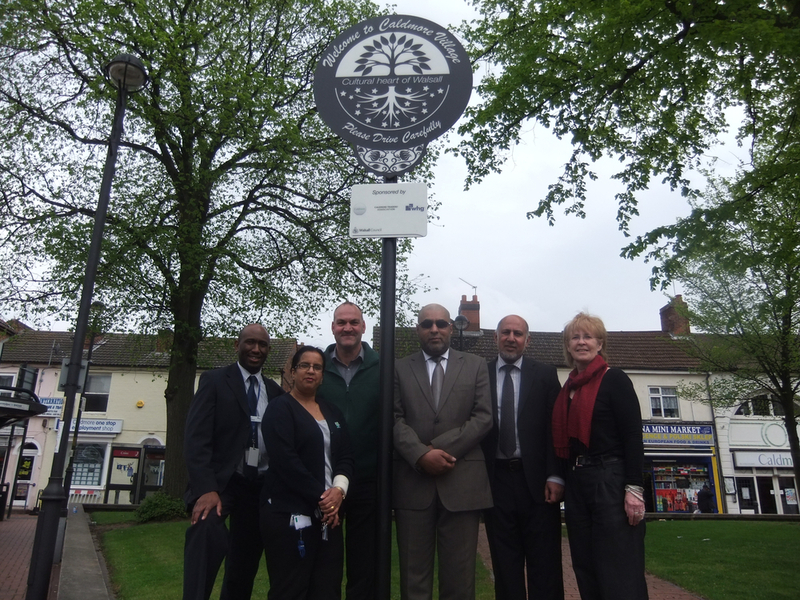 From left: Steve McGregor, Estates Manager with whg, Klair Jassal, Team Leader at whg, Steve Chapman, Service Manager for Tarmac, Ali Mahmood, Chairman of Caldmore Traders Association, Councillor Mohammed Arif and Margot Lambert, Director for Communities and Arts with Caldmore Housing Association. Walsall Council’s support to reinvigorate Caldmore has given birth to a new era in the community. 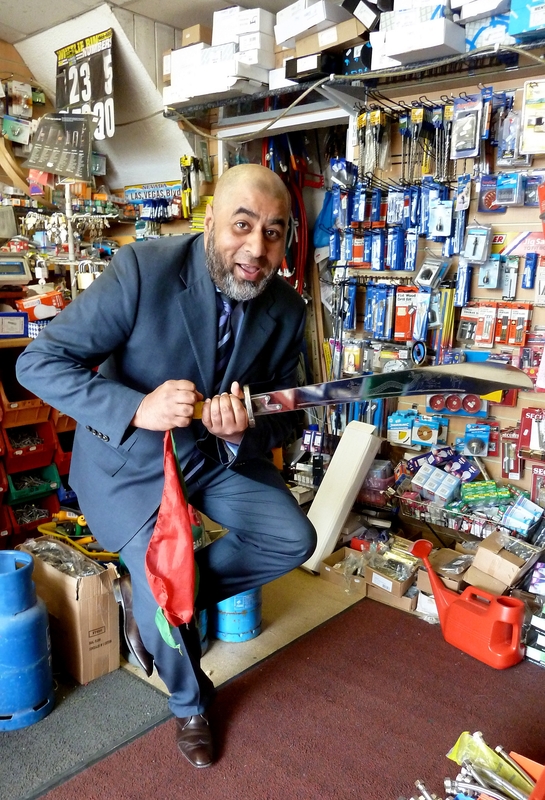 Aided in his efforts by ward councillor Mohammed Arif, members of the Caldmore Traders Association, Walsall Housing Group and Caldmore Housing Association, the entrepreneur said he is delighted to have breathed new life into Caldmore’s identity. “The idea started some years ago when Walsall Council proposed a one-way system through Caldmore Village,” said Mr Mahmood. Since then Mr Mahmood has been campaigning to get re-associate Caldmore with ‘village’ and his efforts have now paid off. The land registry office now officially recognises Caldmore Village. “I am delighted that after all these years the hard work has finally paid off and the signs – Welcome to Caldmore Village – have gone up, ” he said. Ward Councillor Mohammed Arif, said everyone can be justifiably proud of reinvigorating Caldmore. “Thanks to sponsorship from whg, Caldmore Housing, Caldmore Traders, Tarmac for free installation and to Walsall Council we were able to source the 5 village signs that have gone around Caldmore. “I urge all the residents now to use Caldmore Village on all correspondence and signage. I have requested the head and chair of Caldmore Community School to consider adding the village tn the name of the school too. “This is a prime example of what can be achieved when key partners come together to support a vision which benefits the whole community. Klair Jassal, Team Leader for the Central Walsall Area Estate Management Team at whg, shared these sentiments. What a great turn out for the Taste of Caldmore Dinner Dance at Five Rivers A La Carte in Walsall. A few pics of the evening, more to follow! A huge thanks goes out to Mr Ali Mahmood, Executive Committe member and local trader, for organising this sell out event. Also big thanks to the live entertainment, local businesses, Five Rivers A La Carte for great venue & food, and of course our wonderful guests! Caldmore Village Festival 2011 – TOMORROW! It’s now upon us – months of planning, negotiating, fundraising, profile raising, developing, shaping, Monday night Samosa’s and pleanty of love for Caldmore – yes for the second year running it’s Caldmore Village Festival! Caldmore Village Festival proudly presents The Walsall Mela – Sunday 22 May 2011, 11am-8pm @ Walsall Rugby Club Delves Road, Walsall. Stonelifting, Kabaddi, Beeni (or Arm Wrestling), Bench Press, Tug of War, Volleyball and Darts. We want Caldmore to look its very best for this years Village Festival at the end of May. So we’re running a competition for the best business or shop frontage in the area. The winner will receive a plaque for display on their premises and be featured in local press. You can nominate yours or a neighbouring shop for the Caldmore Top of the Shops competition. The only criteria is that the shop or business must be in Caldmore. CLICK HERE for Top of the Shops entry form!